Most of our staff travel, quite often. They do, however, have a place that they like to call "home base". I was born and raised in Hudson, Wisconsin, with the majority of my weekends spent at our cabin near Siren. Trout fishing, bow hunting and chasing ruffed grouse occupied most of my early years. In 1981, I ventured to Oklahoma to learn the business of researching mineral rights ownership for oil companies. By 1983, I had to get back to “the promised land” of Wisconsin. Gaining employment with St. Croix County Abstract Co., in Hudson, I learned real estate title under the guidance of Roger Bevers. After managing a satellite office in Polk County for several years, I decided to go at it alone and in 1989, created Northwest Land Title, Inc., with our home office located in Milltown. Originally concentrating our business in Polk and Burnett Counties, we have steadily grown to cover all of Northwestern Wisconsin. In 2003 we expanded into Siren starting Assured Title, LLC. In 2012 we acquired the Osceola native title company which was founded in 1882 as Oakey and Oakey Abstract. The name since was changed to Guaranty Title Services (GTS). Once we gained ownership, my first prerogative was to change the name back to its roots; that is where Oakey and Oakey Abstract & Title, LLC came about. Our most recent obtainment was in September of 2013 which was Douglas County Abstract & Title, LLC in Superior, Wisconsin. I am a hands-on owner in this industry. My love of the research and history has kept me solidly anchored in the day-to-day research and examining. It’s a rare day that I don’t see something new or find new challenges. Much of my time is spent in the various Court Houses around the area, digging into the dusty old books of the past. My primary goal is to give my customers the very best service, along with the highest quality product available. The purpose of our industry is first and foremost to protect our customer. I never lose sight of that fact. She is currently living outside of Grantsburg with her husband, Dave. Rebecca's 2 biological children are Ashley and Garrett. Garrett recently completed his enlisted status with the United States Marine Corps. Ashley currently works as her assistant and lives in Webster, WI. Her step-son, Lars Thoreson, graduated high school in 2014 and is now attending UW Stout. Rebecca loves to fish, run, walk, hike, kayak, canoe...really, most outdoor activities Rebecca enjoys! She also enjoys writing and recently received her Bachelor in English from the University of Phoenix. Rebecca has been in the title industry for over 15 years and with us now for over 10 years. She is the Real Estate/Title closer out of our Assured location in Siren. She said that the BEST thing about her job is diversity. There can never be two files/closings that are the same and this creates a pretty interesting job environment. 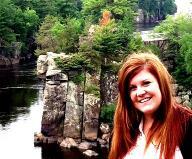 Ashley was born in Brainerd MN and moved to Frederic WI when she was 4. She graduated from Frederic High School in 2012 and attended UW River Falls for her Freshman year of College. Ashley purchased her first home in 2015 and is living in Webster with her boyfriend, Adam, and her dogs and cats. She likes to do anything outdoors especially mudding, camping, fishing, four-wheeling, boating, etc. Her goal is purely to be happy in life and she doesn't like to limit herself. She is always open to new opportunities and experiences. Others describe her as outgoing, free spirited, happy, sympathetic, honest, and friendly. Born and raised in Polk County, Alana has grown to love and appreciate Wisconsin. She has a true passion for the outdoors; especially hunting and fishing. She lives outside of Luck, at the south end of Bone Lake, with her "other half" Mike, their children Ashlyn & Eljay, as well as their animals. She said whenever they get a free weekend, they "strike north or west" to their cabin with the hounds to run bear, bobcat, mountain lion, wolves, coyote, and/or raccoon (there is always a season for something)! She joined the Northwest Land Title team as the Company Representative in July of 2013. Alana graduated from St Cloud State University in 2010 with her Bachelor's Degree in Business Marketing, has over 15 years experience in customer service and over 11 years experience in sales. Her expertise in sales and customer relations will be a vital key in the growth and foundation of NW-Title. Alana is currently focusing her attention on current clients, future client development and marketing to help increase our market share. Her primary goal is to build strong, lasting relationships and to make sure that everyone is receiving the highest level of service and solutions. Barb was born in Minnesota, moved to Wisconsin while she was a teenager and has been living in Shell Lake since 1998. She has 3 children and 8 grandchildren that she loves spending time with. Son, Loren, lives in River Falls with his wife and their 4 boys. Her eldest daughter, Stephanie, is a Nurse and Firefighter in Oakdale, MN. Her other daughter, Corrine, is a full-time mom. She has a cat, Ellie Grace, and two dogs, Stella and Ruby. Barb loves spending time with her kids, grandkids and animals; she also enjoys reading, shopping, walking and being a grandma! Barb has been with NW-Title since 1999 and is John's "right-hand woman". While he is out on the road searching, she is keeping the office under control. She handles all production from start to finish. From production to cleaning, Barb has a handle on all of Milltown's functions! Briana grew up on the east side of St. Paul and in the Hudson area. She has been living in Polk County & St Croix County (on and off) since she was 13 years old. She just bought a house in Balsam Lake where she lives with her son, her mother and their dogs. Her son, Ethan, loves swimming, golfing, trucks and books. Briana enjoys spending time with Ethan, their puppies, family and friends. Briana has been with the company since Feb of 2013. At her current role as a researcher, she loves the diversity! She said that she floats between the 3 offices and learns something new every day. Briana has a degree in Land Surveying and is very excited to be able to utilize her degree in a new facet. "There is so much to learn and every order is new and different. I have met some great people so far, that I otherwise would not have met. I am thankful for this wonderful career opportunity!" In the fall of 2014 Sandy moved to Solon Springs, WI to be closer to her family. She has been a closer for 5 years with closing experience in Wisconsin and Minnesota. When she is not working, Sandy enjoys camping, fishing and spending time with her family and friends.